We were thrilled to learn that Leanne Lee, otherwise known as the Diva of DIY created this family friendly project for our readers! 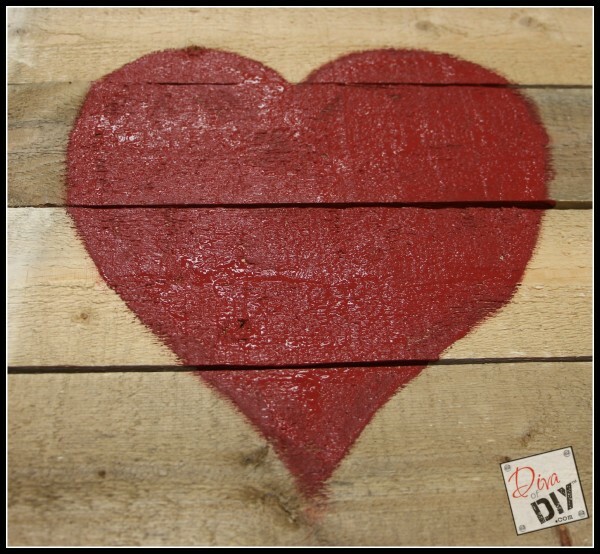 Get the family together and create this wonderful project just in time for Valentine's Day! 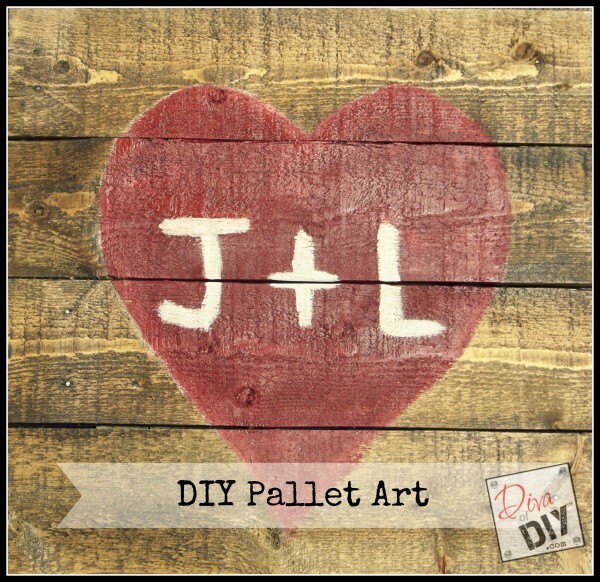 The Diva of DIY, Leanne Lee, is at it again....creating Pallet Art! 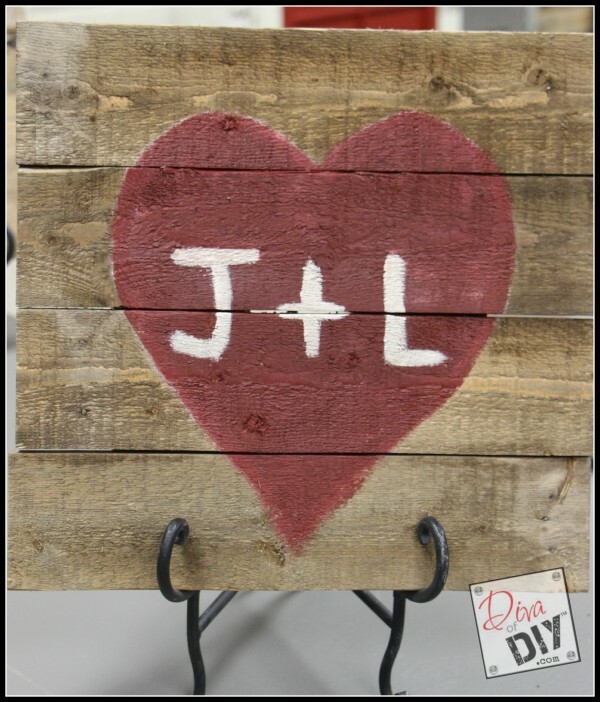 Pallet Art is one of the most inexpensive ways that you can add texture and color to any decor. Not to mention any level of DIY'er can create this piece...it's also a great one to get the kiddos involved in! Begin by cutting 3-6 pallet boards the same length. This length depends on the size of your project. I cut 4 boards 16" long. Next, Cut 2 more pallet boards long enough to fit across your first boards. You will screw these into the back of the pallet wood to hold them together. I cut these 2 boards 14" long. I didn't have the exact red I was looking for. You know...that dirty, barn red? So what does a Diva of DIY do???? We make our own! To tone down a bright red, take a little black and add it in until you get the color you are looking for. 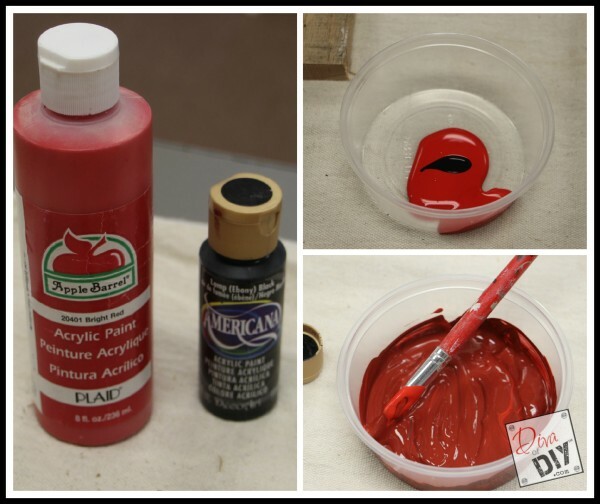 DIVA TIP: When buying acrylic craft paints, buy big bottles in colors with a medium value. Then buy a black and a white and mix your own colors. Take a pencil and lightly outline your design. Not comfortable with your art skills??? No worries...Take a piece of tracing paper and trace your design and then transfer it to your art piece or better yet, just wing it! Making pallet art shouldn't be stressful...it should be fun. Treat it like that piece of paper from junior high and doodle away! Fill your design in and let it dry. This is where you can adjust the design if needed. After it dried, I took a small paint brush and the white craft paint and added my hubby and I's initials. I smile just thinking about that innocent, sweet, junior high crush. Truth be told...I still have a crush on my husband. I hope he likes my DIY Pallet Art I made for him. Last but not least, I aged the entire piece with a little aging glaze I mixed up using Americana's Burnt Umber, water and a sponge. 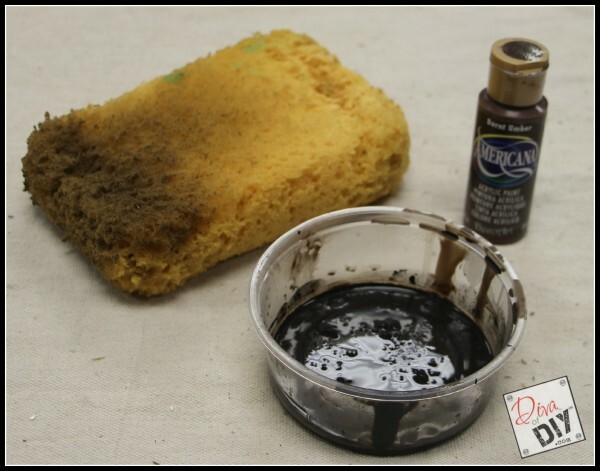 DIVA TIP: To age something instantly....mix 1 part Burnt Umber or Dark Brown Paint to 4 parts water. Stir thoroughly and wipe across the surface with a sponge. Let dry. I had to give a little love to my husband, John, so I made sure to create a little nostalgic piece to remind us of our love! I think it's fabulous, don't you? 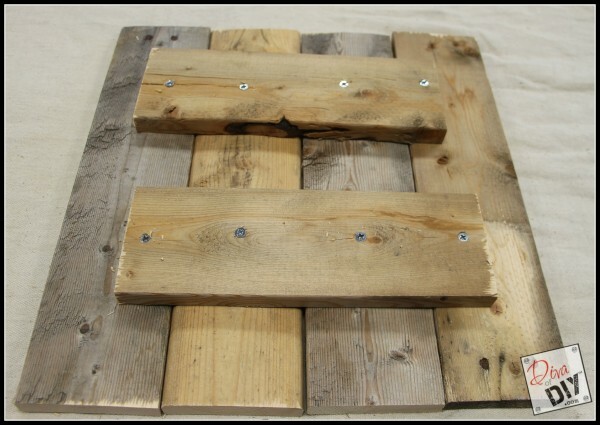 I can't wait to see your Pallet Art Projects! I LOVE seeing the pieces ya'll create and especially because they often turn out better than mine ;) Be sure to share them with me on Instagram, Twitter or Facebook! 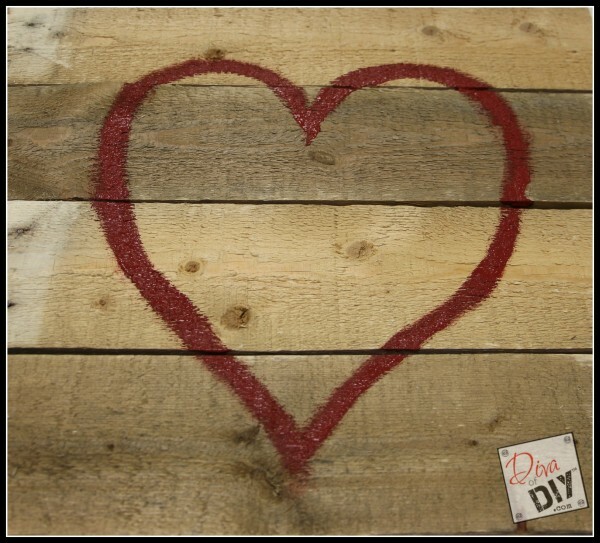 While I'm at it, have you signed up for the Diva of DIY's New Newsletter? It gets you the latest projects delivered to you inbox...I PROMISE I won't sell your info to those spammers....I hate that! Are you going to make this project with your family? Let us know in the comments! Thanks again to Leanne Lee for providing us with this great DIY decor item for families! Glad to hear! 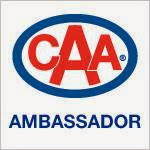 Let us know if you give it a whirl!